The first performance of Handel’s Water Music must be one of the most famous premieres in music history. The lavish pomp and spectacle of the occasion — not least the vast orchestra of 50-plus musicians assembled on the second of several boats that followed George I’s royal barge along the Tharnes from Whitehall to Chelsea on July 17th, 1717 made such an impression on witnesses that the immortal success of Handel’s music was instantly assured. 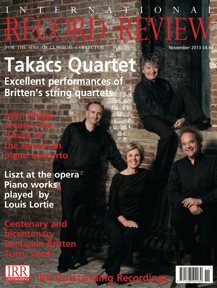 The music itself, with its winning mix of lively popular dances, courtly refinement and majestic ebullience, was an instant hit, and it enjoyed frequent performances throughout the composer’s lifetime in many different guises, in all types of venues and with ensembles of all sizes. Enthusiasm for the Water Music has barely dimmed in the centuries since. Aware that this new recording with his period-instrument Haydn Sinfonietta of Vienna is entering crowded market, conductor Manfred Huss offers an enticing USP: a return to the recently divined probable original ordering of the movements. With no surviving autograph score, modern consensus (based on the evidence of the earliest published edition from 1788) has been that Handel divided his 60-minute work into three suites: an opening suite in F with horns, a central suite in D with trumpets, and a final, more subdued, suite in G showcasing woodwinds . But a recently resurfaced 1718 copy of the autograph, used as the basis for the 2007 new critical edition, indicates that Handel actually conceived the work as a 22-movement single entity — and it is this version which Huss presents here. The reordering is not a radical overhaul (other recordings made since 2007 notably Marc Minkowski’s vibrant 2010 account on Naïve with his Musiciens du Louvre have actually stuck with the three-suite version) but the mega-suite has definite merits. While the first half essentially adheres to the F major suite, the second half mingles the D and G major suites, providing effective contrast and a stronger conclusion. This is certainly interesting enough to justify a new recording, but the stylishness of this Viennese performance, led by distinguished veteran period-instrumentalist Simon Standage, raises it sufficiently above the level of an academic exercise to hold its own with the best on the market. After a brisk but purposeful introduction, the Ouverture springs into action with tangible excitement bustling violins bounce phrases between left/right divided first and seconds with impressive dexterity, oboes and bassoons chatter animatedly. The third movement ‘Allegro’ throws the spotlight onto the pair of horns, who sound a shade too polite (for real chutzpah here the pungently tuned horns of Le Concert Spirituel on Glossa reign supreme), but the percussive propulsion of strumming mandolin continuo imparts an invigorating swagger. Huss’s steady ‘Bourrée’ allows the opportunity for elegant and fun ornamentation in the solo spots, and its tutti is wonderfully lusty. The horns raise their game to match the brilliance of the trumpets, who make their first appearance halfway through, and the impact of the famous ‘Hornpipe’ is further enhanced by increasingly flamboyant timpani extemporizations (Handel did not write any drum parts, but almost certainly expected them to be added in performance). A delightfully delicate solo flute graces the gentle ‘Menuet’ which follows, and a pastoral sopranino recorder contrasts well with the earthy bassoon in the final peasant dances. The stately trumpet ‘Minuet’ rounds the Water Music off suitably, but allowing your player to run on to the filer, the Ouverture to the Occasional Oratorio written 30 years later but remarkably complementary in style will ensure a more satisfying conclusion. After reading Huss’s authoritative advocacy for large orchestral forces a core of 24 strings was, he says, common in the theatres of Handel’s day and his denouncement of the small-scaled period-instrument bands of today for not corresponding ‘at all to the original sound conceptions of the period’ it is disappointing that he employs a hand of only 14 strings for this recording which, with just two violas and cellos and a single double bass, is almost the bare minimum. Moreover, for an album which offers a welcome chance to hear the Water Music in Handel’s (probable) original structure — first, and possibly only ever, experienced with vast forces at the premiere performance — it seems perverse to present it here on such an intimate scale. The closeness pays dividends in the performance’s vivid and nuanced detail, however, and the studio recording, made at the Grafenegg Auditorium in Austria, has just enough bloom. 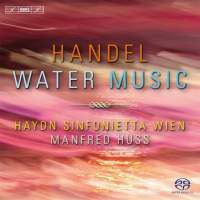 So, regardless of orchestral size, this is as enjoyable a Water Music as any in the catalogue.